REUTERS/Russell CheyneINEOS chemical factory in Grangemouth, Scotland. INEOS, a Swiss-based chemical group, is planning a massive investment in shale gas in Scotland, the BBC reports. The company, chaired by British businessman Jim Radcliffe, owns a production plant in Grangemouth, and wants to boost domestic shale gas production to fuel the plant, which is currently running at a loss and fuelled by natural gas imported from overseas. 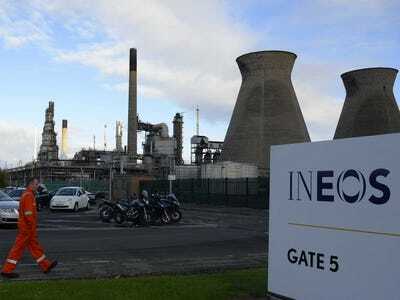 Media reports suggest that INEOS is ready to invest up to £640 million ($US1 billion) in Scotland, although the company did not comment on the news when contacted by Business Insider UK. The Guardian writes that INEOS has acquired licenses for shale exploration in Stirlingshire, and “is expected to attempt to win further licenses in other parts of the country”. Fracking, the drilling technique mostly used to extract gas from shale, is very controversial: it requires a huge amount of clean water to operate and chemicals are injected into the ground. Last year Cuadrilla, an exploration company, announced plans for a fracking project in Balcombe, East Sussex, but had to pull back following violent protests. However, shale gas supporters claim that the technology would allow the UK to shift away from a reliance on coal, a fuel that is much more dangerous for the environment than natural gas. They point to the US which has used fracking in the extraction of both oil and natural gas, leading to a huge leap in production over the past few years. In the UK it is yet to be tested on an industrial scale. As well as Sussex, the north west of England is one of the regions with a high shale gas potential, but anti-fracking protests have sprung up there as well. INEOS’s previous announcement that it would give back £2.5 billion ($US3.9 billion) to local communities met with a similarly hostile response as Friends of the Earth condemned the move as “transparent bribery”.